Shōgoin daikon 聖護院大根 is one of the traditional vegetables of Kyoto and is sometimes referred to as Kyo-daikon. It is said that during the early 19th century, a farmer moved to Kyoto from Owari province (present-day Aichi-ken) and started cultivating ordinary long daikon radishes in the vicinity of the temple Shōgoin. 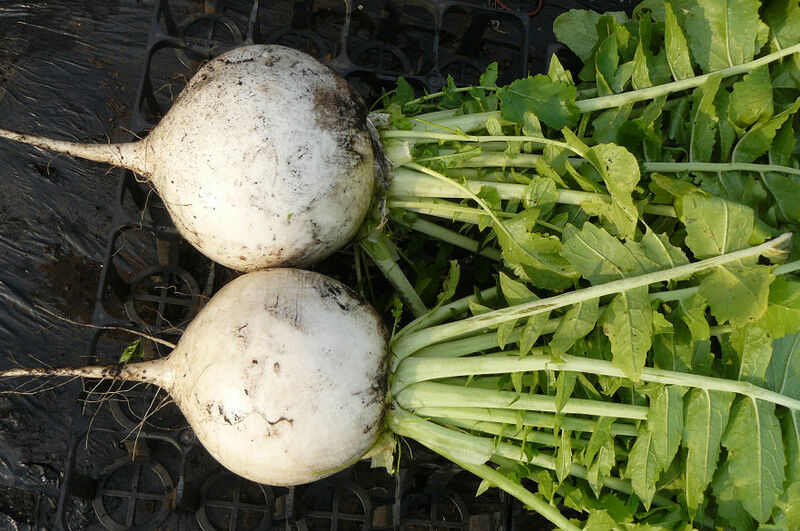 It seems that some of the daikon seeds produced a mutant round daikon, but the farmer was so intrigued with this new vegetable that he continued to cultivate the variation instead of the regular-shaped daikon. Since then it has become one of Kyoto’s unique vegetables, valued for its shape and its very fine white flesh with a mild flavour, much suited to the delicacy of Kyoto cuisine. When boiled it keeps its firm texture and doesn’t break apart like regular daikon. The shōgoin daikon is mostly now grown in the northern part of Kyoto prefecture in the Tango area, where the heavy snowfalls in winter produce the best flavour. 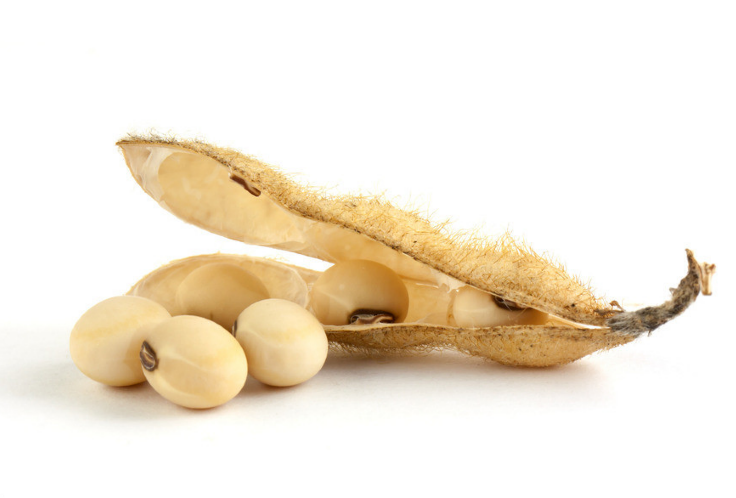 It is also dried and shipped all over Japan. It is sometimes called vegetarian dried squid because of its resemblance to the squid which are cut and dried on racks in a similar way. Shōgoin daikon can be prepared in much the same ways as standard daikon, but the flavour is milder and slightly sweeter, with a firmer texture; however, it is rarely used as “oroshi” (finely grated). Firstly, mix the egg yolk and sugar well, then blend in the sake. Warm the hatcho miso in bain marie. When it’s cooled, add it to the egg and sake. Keep aside. 1. Under the skin of the daikon is rather tough layer that should be removed. If you don’t peel it enough then the daikon won’t have soft texture and will be too hard. So peel the skin quite thickly – up to 2 cms deep (alternatively, cut the daikon into slices and then cut around each slice). Using the water that has been left after first rinsing the rice for dinner, parboil the daikon. Parboiling in this way takes away the bitterness of the daikon and helps bring out its sweetness. 2. Using a good amount of konbu dashi, lightly simmer the daikon until tender; in this way, the umami of the konbu gradually penetrates the daikon. 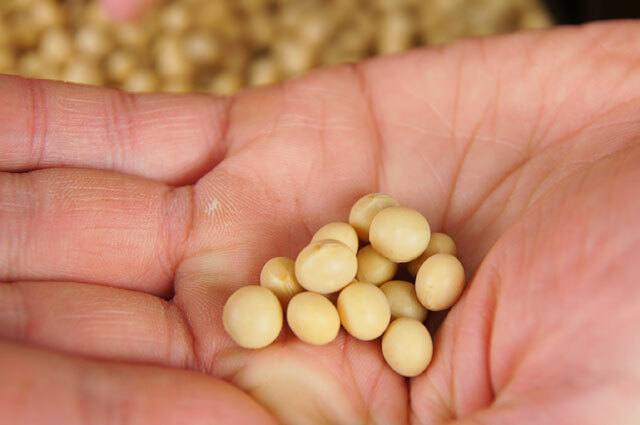 The key point here is that in order for the heat to draw out the daikon’s natural sweetness, the deciding factor is the quality of the konbu dashi that you use. And in order to make the most effective dashi, please use the best quality konbu that is marketed for use in dashi. 3. 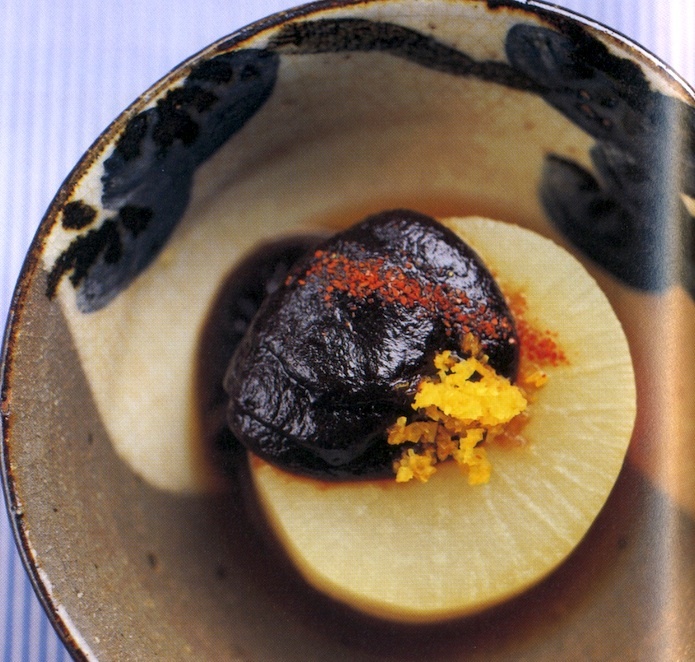 Place the daikon in a bowl, spoon a little of the awase-miso over the daikon, and garnish with grated yuzu zest (or other citrus zest) and pinch of togarashi or shichimi (or similar types of chilli powder). 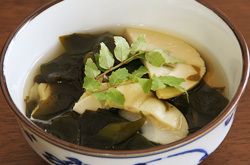 This recipe highlights the delicate flavours of two seasonal ingredients: bamboo shoots which appear in the spring and wakame which is harvested fresh at this time. This is a very typical Japanese “recipe” because it doesn’t give any measurements! 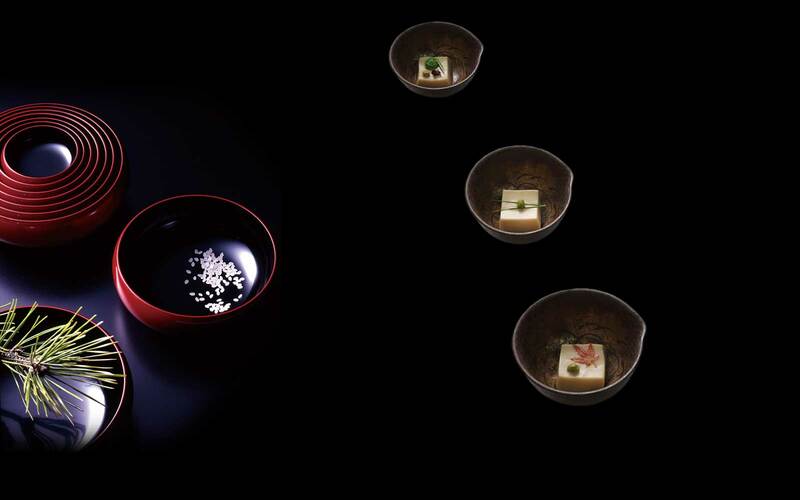 An important aspect of Japanese cuisine is to develop your sense of taste and be prepared to cook by taste alone. When I first learned about Japanese cooking this was something that frustrated me because I just wanted to be told “Do it like this.” But cooking is as much an art as it is a science and the challenge is to have “the courage of your convictions” – wise advice from the wonderful Julia Childs from back in the 1950s. It takes time to develop the confidence required to trust your own interpretation in using the ingredients as a kind of artist’s palette but it is so satisfying when you get it “right” – that is, when the artwork you create tastes and looks like you had imagined, or perhaps you get a nice surprise and it is better than you imagined! 1) Cut the bamboo shoots into round slices about 5mm thick. The pieces that are bit too big, slice into half-moon shapes. 2) Rinse the wakame in water (if you are using salted wakame change the water 2 – 3 times) so that it just covers the seaweed in a bowl, then roughly chop the seaweed into 3cm lengths. 5) When the soup has started to simmer again, remove from the heat and serve with a garnish of kinome sprinkled on the top. Leaving behind the frenetic busyness of the modern bustling metropolis of Kyoto, as you step over the threshold of the great gateway that marks the entrance to the vast grounds of Daitokuji, one of the five great Zen temple complexes of Kyoto, you enter into a sacred space that seems timeless and imbued with tranquility. Nestled within this great rambling temple complex, following one of the meandering stone pathways flanked by high earthen walls of secluded little temples and ancient twisting pine trees, you eventually arrive at a small sub-temple called Daiji-in. Within this temple is Izusen, a shojin-ryori (Buddhist vegetarian) restaurant that specialises in teppachi-ryori. 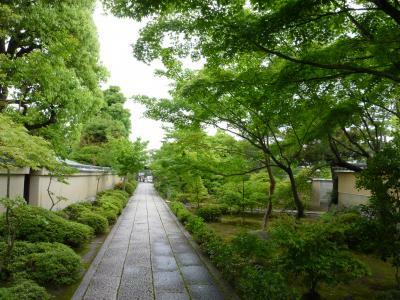 Teppachi literally means “iron bowl” and it refers to the custom of Buddhist monks making daily alms rounds, carrying a bowl in which they received food offerings from people in the neighbourhood who supported the temple. 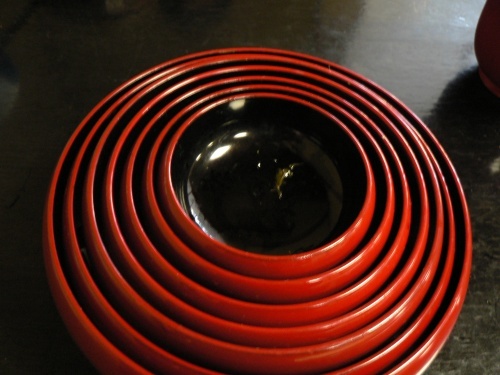 Nowadays, the monks of Daitokuji temple no longer make these rounds, but the traditional bowls they once used are now a feature of this restaurant. 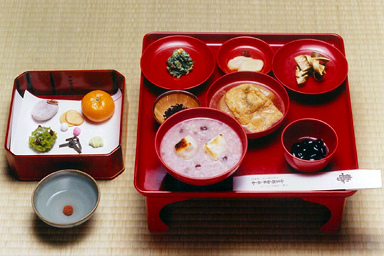 The serving dishes are a set of lacquer bowls in which the courses of the meal are served and which fit neatly inside one another when finished. The delicacies that are served in these special bowls vary according to the season, but what follows is typical spring menu. 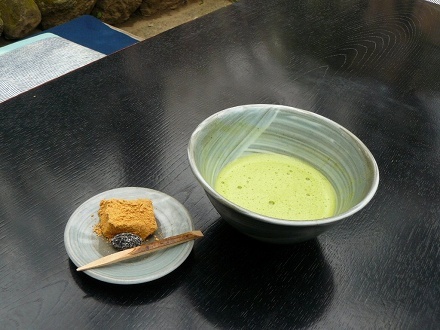 This meal begins with light matcha (whisked powdered green tea) and warabi-mochi, a glutinous sweet made not from rice flour (mochi) but from bracken starch (warabi-ko), covered with kinako (toasted soy bean flour). 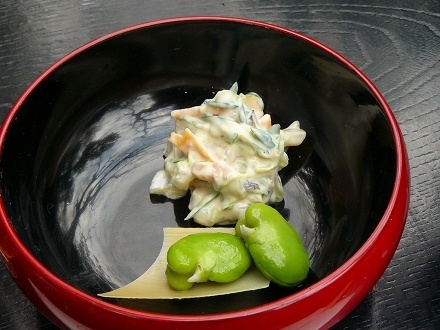 Next, shirazu-ae: vegetables coated in a light vinegar and sesame paste, served here with fava beans (soramame). 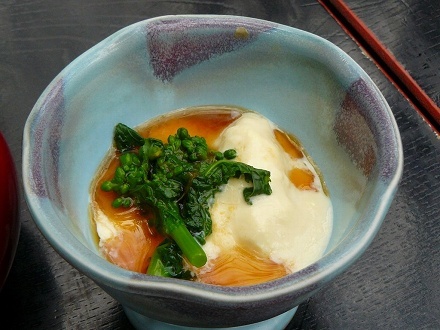 Next, broccolini with yuba (soy milk skins). 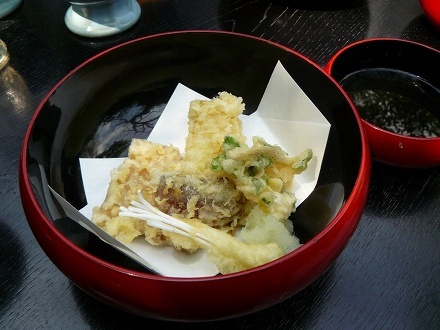 Yuba is an essential ingredient in shojin cuisine because it is very high in protein. 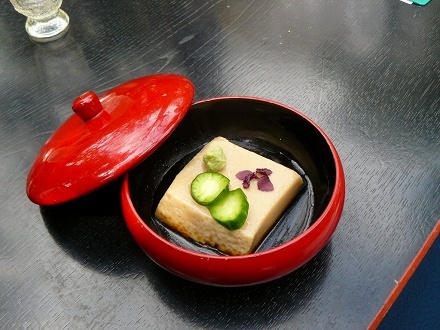 Next, goma-tofu with sliced cucumber and wasabi: goma-tofu is not the usual soy bean tofu, but instead is made from ground sesame seeds mixed with kudzu flour. 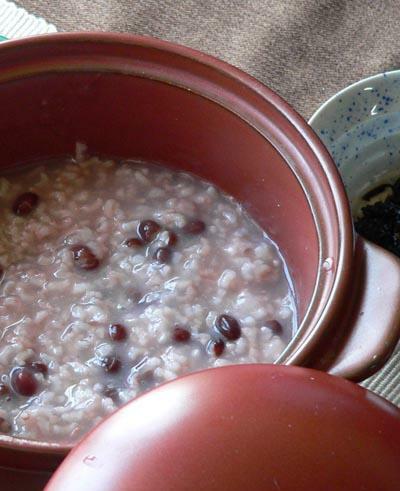 It is a signature dish in shojin-ryori of Mt Koya. 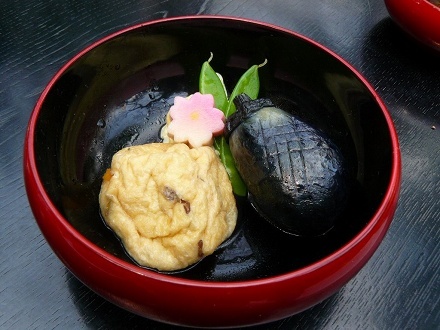 Next, ganmodoki and fried baby eggplant: ganmodoki, which literally means “mock goose,” is made from tofu mixed with vegetables, made into a ball, boiled first and then fried. It is used as an offering on the altars of temples in Mt Koya. Next, tempura vegetables, including shiitake mushrooms, enoki mushrooms, mitsuba trefoil leaves. Next, clear wakame (seaweed) soup. 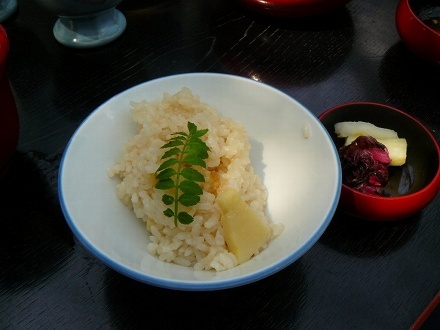 Finally, rice with a seasonal ingredient and pickles – this rice is served with kinome, a new sprig of the Japanese pepper tree, which is traditionally a sign of spring. 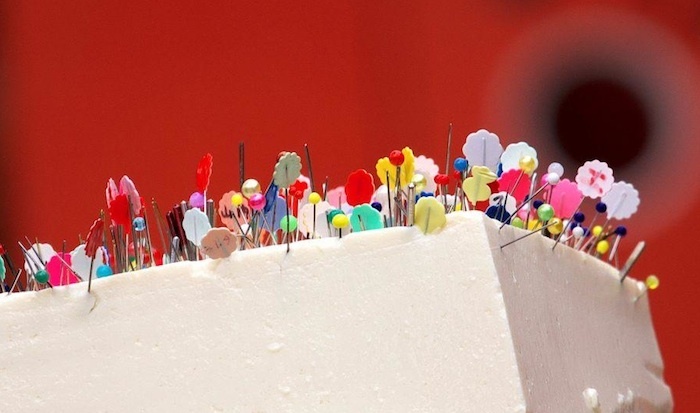 Every year on February 8th, various temples and shrines around Japan have a memorial ceremony for worn out and broken sewing needles. 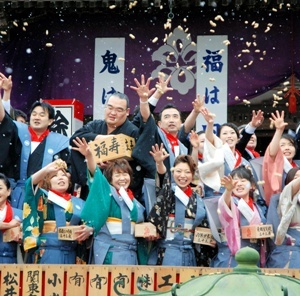 People bring their old and broken needles to the temple and place them in a block of tofu or konnyaku. The soft bed is offered as the final resting place for the needles that have worked so hard. The pilgrims who bring their needles are offering their gratitude for the needles’ hard work and also praying to improve their skills in sewing. 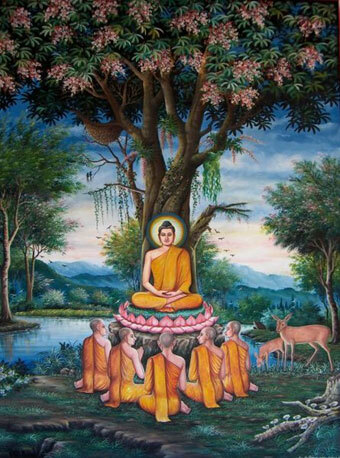 As well as being an act of gratitude, the pilgrims also pray that all the things that are broken in their lives are laid to rest in a bed of softness – taking away all the sharp pain in their lives. The gentle soft taste of silken tofu is to be enjoyed perfectly unadorned, as it is. 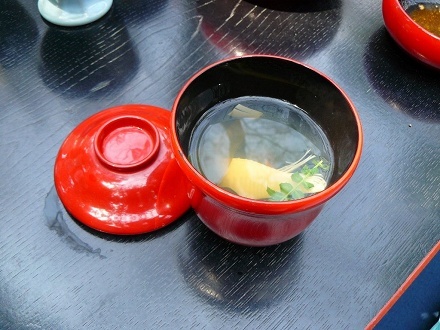 In Kyoto, the best tofu is prepared using the natural spring water that is so delicious in Kyoto. 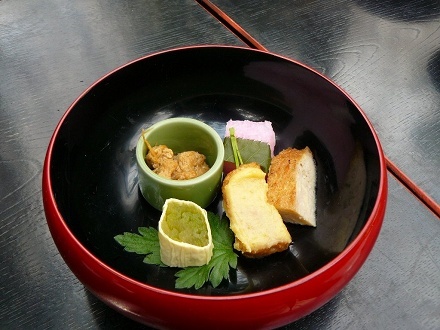 There are a number of famous temple restaurants in Kyoto that serve yudofu 湯豆腐, which is just plain cubes of tofu simmered in spring water, that you eat dipped into a light soy sauce and topped with spring onions and grated ginger. The texture and subtle favour is enjoyed in the meditative surroundings of an ancient garden, so that all of the senses are engaged in the simple act of eating this perfect humble food. It is a sublime culinary experience. The key to this dish is to use only the highest quality tofu, spring water and konbu. 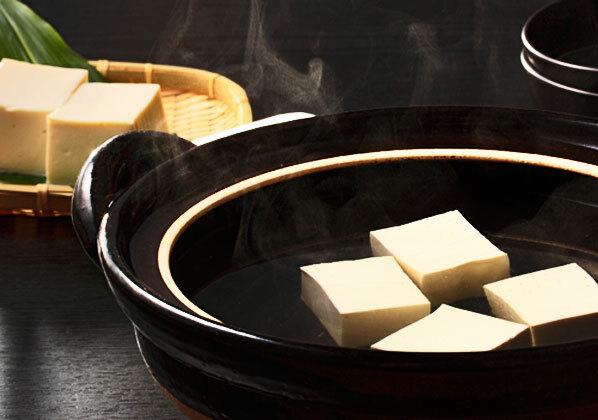 Traditionally, this dish is prepared in a donabe clay pot on a small table burner, but you can use a regular saucepan and then transfer the tofu and water into a warmed casserole pot. 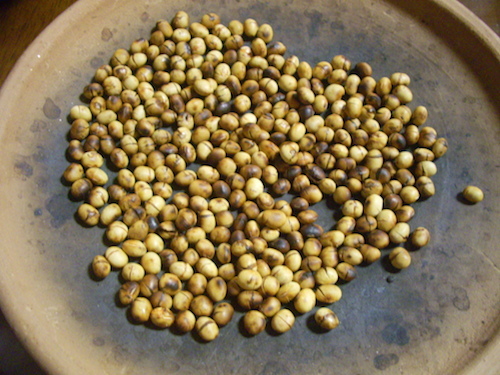 Place the konbu in the water and leave for about 5 hours. Put the saucepan on a low heat until the first bubbles appear, then turn off the heat and pour into a pre-warmed casserole dish with the tofu in it. Each person takes a piece of tofu and puts it in their bowl, adding the dipping sauce and condiments to their own liking.